Forkhead box P3 (FOXP3) is a master transcriptional factor of regulatory T-cells (Tregs). Recent studies have shown that FOXP3 is associated with growth inhibition of cancer cells. However, the role of FOXP3 in acute T-lymphoblastic leukemia (T-ALL) cells is not known. It was also reported that NOTCH signaling promoted the expression of FOXP3 in Tregs. However, the effect of FOXP3 on NOTCH expression in T-ALL cells is little known. Therefore, we examined the effect of FOXP3 knockdown on the proliferation of T-ALL cells and NOTCH1 signaling. Two T-ALL cell lines Jurkat and KOPT-K1, harboring activating NOTCH1 mutations, were transfected with small interfering RNA against FOXP3. Cell growth was assessed with a colorimetric assay and morphology was observed under a microscope. FOXP3 knockdown significantly reduced cell growth and induced morphological changes suggesting apoptosis. Quantitative polymerase chain reaction revealed that FOXP3 knockdown caused the downregulation of mRNA expression of NOTCH1 and HES1. These findings suggest that FOXP3 supports the growth of T-ALL cells although this can not be generalized because we examined only two cell lines. The observed growth suppression can be partly due to the downregulation of NOTCH1 signaling. FOXP3 may be a potential therapeutic target in T-ALL. T cell acute lymphoblastic leukemia (T-ALL) is a highly aggressive disease caused by malignant transformation of early T cell progenitors , characterized by mutation of NOTCH1 [1, 2]. NOTCH1 signaling pathway is essential for self-renewal and differentiation in hematopoietic stem cells . Consequently, NOTCH1 direct target genes and NOTCH1-regulated gene expression have been rigorously studied for elucidating the oncogenic mechanism in T-ALL . Forkhead box P3 (FOXP3) is a master transcriptional factor for the development of regulatory T-cells (Tregs) . In addition to Tregs, the expression of FOXP3 is reported in various cancer cell lines including Jurkat, a T-ALL cell line . Upregulation of FOXP3 is associated with inhibition of cell growth in solid tumor cell lines from breast , prostate , epithelial ovarian  and gastric  cancer. However, the role of FOXP3 on the proliferation of T-ALL cells is not clear yet. To assess the effect of FOXP3 knockdown on cell growth, we introduced small interfering RNA (siRNA) against FOXP3 in T-ALL cell lines. Several studies show the upregulation of FOXP3 by NOTCH signaling in Tregs: indeed, NOTCH ligands induce the differentiation of CD4+ CD25+ Tregs [10, 11] and NOTCH signaling promotes the expression of FOXP3 in Tregs [12, 13]. However, little is known about the relation between FOXP3 and NOTCH1 in T-ALL cells. A recent study has shown that a γ-secretase inhibitor that blocks NOTCH activation reduces the expression of FOXP3 in Jurkat cells . We decided to examine whether, on the other hand, FOXP3 has an effect on NOTCH1 in T-ALL cells. Therefore, we investigated the expression of NOTCH1 and hairy and enhancer of split-1 (HES1), a NOTCH1-targeted gene, after knockdown of FOXP3. We used two T-lymphoblastic leukemia cell lines, Jurkat and KOPT-K1, harboring activating NOTCH1 mutations . Jurkat cells were purchased from the European Collection of Cell Cultures (Porton Down, Wiltshire, UK), and KOPT-K1 cells were donated by Drs. Harashima and Orita (Fujisaki Cell Center, Okayama, Japan). 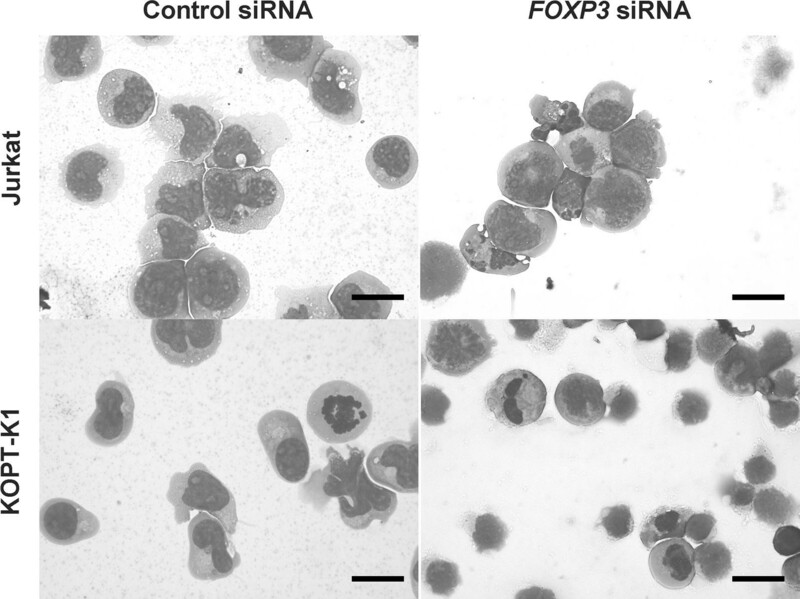 FOXP3 knockdown was performed by transfecting small interfering RNA (siRNA) targeting FOXP3 into the cells. Three different pre-designed siRNAs (Stealth siRNA™) targeting FOXP3 (HSS 121456, 121458, and 181786) were purchased from Life Technologies (Carlsbad, CA, USA). Stealth RNAi negative control Duplex (Life Technologies) was used as a control. Cells were transfected with 80 nM of each siRNA using the Neon™ pipette tip chamber-based electroporation system (Life Technologies) according to the manufacturer’s instructions, and immediately transferred to culture medium. To assess cell proliferation, we used the colorimetric WST-8 assay (Dojindo Laboratories, Kumamoto, Japan). Cells transfected with FOXP3 siRNA or control siRNA were cultured in RPMI-1640 supplemented with 10% fetal bovine serum in 96-well culture plates in a humidified 5% CO2 atmosphere for 5 days. Then, WST-8 and 1-methoxy-5-methylphenazinium methyl sulfate were added, and optical density (OD) was measured with an ELISA plate reader. Relative cell proliferation was calculated as the percentage of the mean OD value normalized to that of the control. The effects of the siRNA on cell morphology and apoptosis were examined in cytospin preparations stained with Wright’s stain and observed under a microscope. To evaluate the effect of FOXP3 knockdown on mRNA expression, RNA was extracted from the cells 4 h after the electroporation using the High Pure RNA isolation kit (Roche Diagnostics, Mannheim, Germany) and used for first-strand cDNA synthesis. The effects of FOXP3 silencing on gene expression were examined by quantitative polymerase chain reaction (qPCR) in a LightCycler (Roche Diagnostics) using a FastStart DNA Master SYBR Green I kit, LightCycler primer sets (Roche Diagnostics) and QuantiTect Primer Assays (Qiagen, Hilden, Germany) according to the manufacturer’s instructions. The expression of each mRNA was normalized to that of β-actin (ACTB) mRNA, which we measured concurrently. All statistical analyses were performed using the R freeware (http://www.r-project.org). For intergroup comparisons, we used the Student’s t-test. Correlation analysis was performed using Spearman’s rank correlation coefficient (rho). All P-values were two-sided, and P-values ≤ 0.05 were considered statistically significant. We used the GraphPad Prism 7.00 software (GraphPad Software Inc., La Jolla, CA, USA) to generate all graphs. Data was presented as the mean ± standard error of the mean. We knocked down FOXP3 expression by introducing siRNA against FOXP3 in Jurkat and KOPT-K1 cells. The most potent siRNA against FOXP3 was HSS121458 (5′-CCGGAUGUGAGAAGGUCUUCGAAGA-3′). Upon RNA interference, the expression of FOXP3 was significantly reduced to 28.6% ± 3.2% and 44.5% ± 18.7% in Jurkat and KOPT-K1 cells, respectively, as shown by qPCR (Table 1). Expression of FOXP3 had a trend to correlate with expression of NOTCH1 in Jurkat (rho = 0.771, P = 0.103) and KOPT-K1 (rho = 0.829, P = 0.06). To evaluate the effect of FOXP3 on the cell growth, we performed proliferation assays 5 days after RNA interference (Fig. 1). Cell growth was significantly suppressed to 21.9% ± 3.01% and 14.2% ± 0.51% in Jurkat and KOPT-K1 cells, respectively. Additionally, observation of cytospin preparations indicated that apoptotic cells with nuclear condensation and apoptotic bodies appeared upon silencing of FOXP3 in Jurkat cells and KOPT-K1 cells (Fig. 2). Because knockdown of FOXP3 inhibited cell growth and induced apoptosis, we hypothesized that FOXP3 is associated with the expression of genes that induce proliferation of T-ALL cell lines. To understand if this was the case, we investigated the expression of NOTCH1 and HES1 in FOXP3-silenced cells. We found that the expression of these genes was significantly reduced to almost 50% in Jurkat and KOPT-K1 cells compared with control cells (Table 1). The current study showed that silencing of FOXP3 caused growth suppression and apoptosis. The upregulation of FOXP3 has been reported to inhibit cell growth in several solid tumor cell lines [6–9]. However, we found opposite results. FOXP3 promotes tumor proliferation in melanoma , thyroid cancer cells  and radiation-induced T-cell leukemia in Balb/c mice . The published data are inconsistent even in the same tumor cell lines such as breast and gastric cancer . We believe that the role of FOXP3 on cell growth can diverge in each cell lines due to different mechanism of oncogenesis or proliferation. We found that knockdown of FOXP3 reduced NOTCH1 expression in T-ALL cell lines. The observed growth suppression and apoptosis can be partly due to the downregulation of NOTCH1 signaling because NOTCH1 plays a major role in the growth of T-ALL cells. Previous studies have shown that NOTCH1 induces the expression of FOXP3 in Tregs. Samon et al. showed that NOTCH1 and transforming growth factor (TGF)-β1 cooperatively support the expression of FOXP3 and the maintenance of peripheral Tregs by allowing the binding of NOTCH signaling-related molecules to the promoter of FOXP3 . In addition, Luo et al. reported that inhibition of NOTCH1 reduced FOXP3 expression in Jurkat cells . Conversely, our study showed that FOXP3 affected NOTCH1 expression in T-ALL cell lines. Our study has clinical relevance because it points to FOXP3 as a new therapeutic target in T-ALL. Suppression of FOXP3 in T-ALL can lead to both reduced cell growth and apoptosis. In addition, expression of FOXP3 in cancer cells might be associated with immunosuppression. For instance, Karube et al. reported that FOXP3-positive adults with ATLL suffered from severe infectious diseases more often than the FOXP3-negative patients . On the same note, FOXP3 expression in cancer cells might represent a tumor escape mechanism [20, 21]. In hematopoietic malignancy, lymphoma cells expressing FOXP3 in ATLL patients evaded host immune response including cytotoxic T lymphocytes . Therefore, the targeting of FOXP3 in T-ALL might not only affect the proliferation of tumor cells but also improve the immunosuppressive status of the patients with T-ALL. In summary, FOXP3 knockdown inhibits the growth and reduced NOTCH1 expression of T-ALL cells. Reduced NOTCH1 signaling can be one of the mechanisms of the growth suppression. Therefore, FOXP3 may be a potential therapeutic target in T-ALL. We suggested that FOXP3 support the growth of T-ALL cells. However, this can not be generalized in T-ALL cells because we just examined only two T-ALL cell lines. To show the universality of this phenomenon, we have to examine other T-ALL cell lines and T-ALL cells from patients in the future. We also showed that FOXP3 knockdown induced apoptosis based on morphological changes of the cells. We tried to show apoptosis at the protein level with immunoblot analysis for caspase-3 activation or flow cytometry for phosphatidylserine externalization. However, we could not obtain the clear results because siRNA induction rapidly caused cell death and degradation of proteins including α-tubulin. We also have to show apoptosis of the cells with some other methods in the future. SY contributed to the design, carried out experimental work, and wrote the article. MI, ES, and MO carried out experimental work. ST contributed to the design, wrote the article, and gave final approval. All authors read and approved the final manuscript. Data is available upon reasonable request. This work was supported by JSPS KAKENHI Grant Number JP26460669.